Board and Card Game reviews – Gaming thoughts and reviews from a veteran gamer. Steam Works is a game by Alex Churchill, published by Tasty Minstrel Games. It is for 2-5 players. In this game, players take on the role of inventors in a Steampunk world. They will be trying to create various devices for Queen Victoria to gain prestige. In the end, the player that gains the most prestige will be declared the winner and will become the Royal Inventor to Her Majesty Queen Victoria. To begin, the board should be placed in the middle of the play area. All the different tiles should be separated into individual stacks according to their backs. The 8 starting tiles are shuffled and placed face up onto the spaces of the blue conveyor belt on the board. The Age I, Age II and Age III stacks should be shuffled separately and then placed face down on the corresponding spaces on the board. The same should be done with the 3 basic source stacks. Each player is randomly given a Persona board which they should place in front of themself on the A side. They then receive cash and basic sources that match those shown on their Persona board. Each player also receives 2 mechanics in their chosen color, which are placed on the 2 leftmost mechanics spaces on their Persona board. 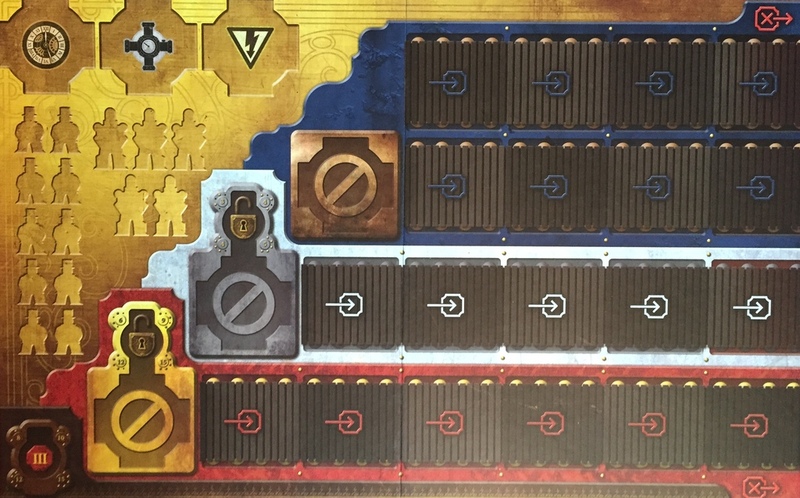 The remaining mechanics and automatons in their color are placed on the corresponding spaces on the board. A number of clock counters are placed on the Age II, Age III and End Game spaces as indicated on the board for the corresponding number of players. The first player is chosen and is given the start player marker. Play now begins. The game is played over several rounds. Each round players will take turns either paying to place a mechanic or passing and collecting income. Paying to place a mechanic is as simple as choosing one of your mechanics, paying the cost printed underneath them and placing them on an available space on either your own Persona board or any source tile in any device that’s already in play. If the player chooses to place a mechanic on their Persona board, they have 4 different actions they can choose from. They can take the rightmost tile of any conveyor belt, they can take any one basic source, they can build a device of size 2 from components and sources in their supply or they can activate one of their sources. It should be noted that when building a device, it must contain at least one source and one component. Each source must be connected to at least one component and each component must be connected to at least one source. Another option for the player is that they can also choose to place one of their mechanics on another player’s device on their source tile. If this action is chosen then the device’s owner takes a clock counter from the current age’s stack. Once a source tile is activated, either by the owner’s mechanic or by another player’s, then it sends power to any components directly connected to it. The player can freely choose to activate those components in any order they choose. If the source produces multiple types of power, then the player may choose which type of power to send in each direction. The other option a player can take is to pass and collect income. If the player doesn’t have the money to place a mechanic or they simply choose not to, then they can pass. They will then place the mechanic onto their Persona’s picture and collect the cost for the mechanic from the bank instead of paying it. Play then passes to the next player who will pay to place a mechanic or pass. This continues until all player’s mechanics have been used. At this time, the round ends. After the round is over, there are a few clean up steps that take place. First, each player will retrieve all their mechanics from wherever they are and place them back on their Persona board. The Automaton is returned to the board. Next, players check to see if the current stack of clock counters is empty. If it is, then the age has ended and a new age begins. If players were in Age I, then Age II begins and each player gains their third mechanic. The Age II stack is now used. If they were in Age II, then Age III begins and each player gains their fourth mechanic. The Age III stack is now used. If they were in Age III, then the game is over and final scoring occurs. We’ll discuss the end game in a moment. Next, the conveyor belts advance and get refilled. Any tiles remaining on the rightmost space of any belt on the board are now returned to the bottom of their corresponding stack. Each tile now is moved as far right as it can go. If a new age has started, then any empty spaces on the conveyor belt for that stack are now refilled. If there aren’t enough tiles in the current stack to fully refill a conveyor belt with, then the players must remove the remaining clock counters in the current stack from the game. This will then unlock the next age. If the current stack is the Game End stack, then the game is over. Once the belts have been filled, the start player marker is passed to the next player in turn order. A new round will then begin. The game continues until the Game End stack of clock tokens has been emptied. Once this happens, final scoring occurs. Each player will now add up their prestige points from any prestige chips they may have collected. They also earn prestige points from clock counters, as well as from tiles in their completed devices that have a prestige point icon on them. Players compare their points and the one with the most prestige is the winner. This game has a lot of nice looking pieces. The best looking part, in my opinion, would be the Persona boards. I love the artwork on these and think they look absolutely great. I will say that I’d wished that they had been a little bit thicker, like maybe the same thickness as the tiles instead of on the fairly thin cardboard. Speaking of the tiles, these are all thick cardboard which I’m very happy about. They could have used cards which would have slid around on the table and been a complete disaster. Thankfully they didn’t go that route. I do like that you can pretty much sit the different tiles out without having to worry too much about them getting messed up. However, I kind of wish that there had been more to these than just a bit of wording and some connectors. I would have liked to see my machine come to life in front of me. Instead I’m looking at a bunch of tiles arranged in front of me. Also made of thick cardboard are the clock tokens, money and prestige chips which I like the designs of, especially the money tokens. Of course the game is simply begging for some metal coins to upgrade it with. As a matter of fact, I think I saw some recently that have a very similar look to them which would most likely work extremely well. Needless to say, there’s a HUGE stack of punchboards inside the box when you first open it up. It’s gonna take you a bit of time to punch everything out. Kind of reminds me of the hours I spent placing stickers on the bundles of money for Millennium Blades. The game also has some wooden pieces included. 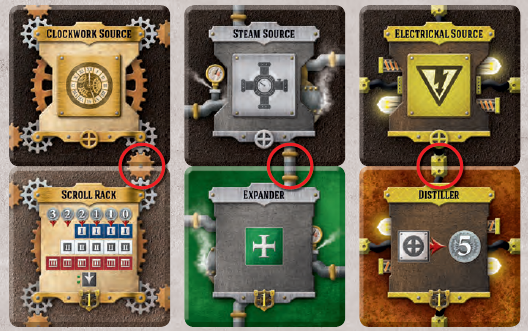 There are mechanics and automatons in 5 different player colors, as well as the start player token. These are all very brightly colored and look great. I like the shapes that they chose for these. You really get a sense of the Steampunk theme from the shapes. Finally the last piece is the game board. I like that there are places for everything to sit on the board. I even like the conveyor belt style place holders for the different tiles. However it does seem to be lacking a bit, especially thematically. I just don’t get the same feel from it that I do from the rest of the game pieces. Overall though, I think it looks fine. It’s not perfect but it’s not bad either. The rulebook for this one is nice. There are plenty of pictures and examples throughout the book. There’s a really great section on setting up the game with a full page picture of how it should look. About halfway through the book there is a section devoted to the different Persona boards. However only the B sides are referenced, there’s nothing to explain the A sides. You pretty much have to figure it out on your own by looking at the B side explanations. I didn’t like that at all. I felt that a simple paragraph could have explained this so that you didn’t waste a lot of time looking for what each one did. Bad show. The book also has a glossary with all the different tiles with explanations of how each one of them works. Now this was actually much appreciated and a great idea. I like that there are pictures of each one along with the descriptions. The rules themself felt a little haphazard and vague to me. They start off explaining how the tiles work before going into the actual rules. From there it just felt like what was presented didn’t fully explain things the way I felt that it should have. Even though there were examples to help explain things, I felt like a lot of what needed explaining wasn’t covered or given an example of. Overall, I would have preferred a more streamlined and detailed explanation of the rules. The book looks good but needs some work. I like the Steampunk genre. I mean, I REALLY like the Steampunk genre. I like the outfits, the technology, the theme. I like it all. On the outside, this game should be right up my alley and something that I really like. I like how that in a lot of ways, this game is a worker placement style game. You place your mechanics on a spot and then take an action. Simple. I like that you’re connecting different pieces together to form interesting new machines that will help you do lots of various things. I like that each of the Personas have different actions that you can do making each one unique. That is when you play with the B sides. All that is great. However, when playing with the A sides, there is really nothing different and so thematically it’s lacking. Things like this make the game feel a bit bland to me. It’s all well, fine and dandy that there are plenty of actions to take and that you can arrange things to help you out. That’s great. I just would have liked there to have been a more thematic feel to the game. For me, the game is just a tile laying game with some worker placement tacked on. I’m not big on tile laying games, so maybe that’s why this one falls a little short with me. I’d have rather seen a board with several different areas to place my mechanics to build different pieces and then have had some actual cardboard pieces that could either have been laid out in front of me or even put together to form some weird looking contraptions. Think Oceanos, how that you have these many different puzzle pieces that you put your sub together to be bigger and better. I’d have liked that a lot more. Now listen, I know I’m being a bit hard here. The game isn’t bad. In fact I do like several aspects of it. I’m just used to getting more. Fans of the Steampunk genre that don’t mind tile laying games with a bit of worker placement, might actually enjoy this one. For me, I’m just ok with it. I would play it again if someone asked. It’s just not one that will be on my top 10 list. I would recommend trying this one first to find out if it’s for you or not. 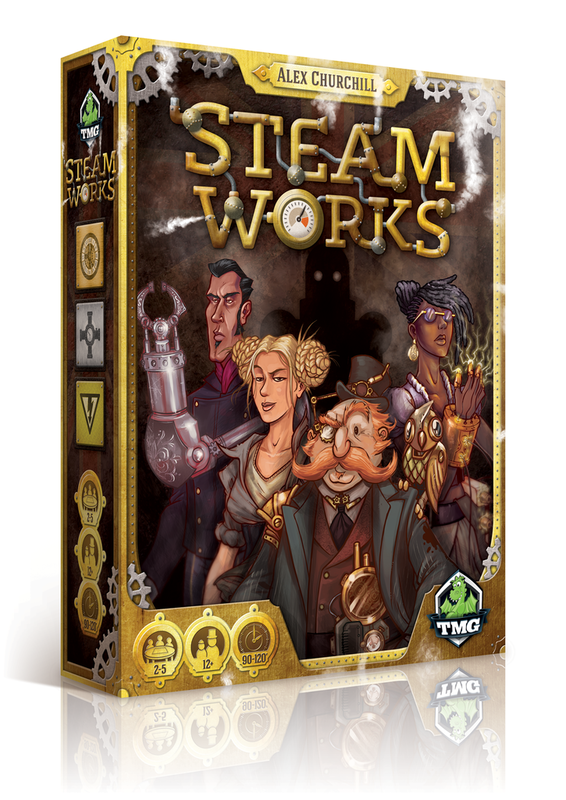 Steam Works is a tile laying game of worker placement set in the Steampunk genre. It’s a bit too long with game sessions lasting over an hour and a half, many lasting closer to 2 hours. Mostly the components look quite nice but some aspects feel a bit unconnected with the theme and somewhat bland. The rulebook is a little bit vague on several items and could use a bit more work streamlining everything. For me, the gameplay is ok. It just feels a bit disconnected from the overall theme of the game. Griping aside, the game isn’t bad, it just isn’t what I was expecting. I still like many aspects of the game and would play it again if asked. Fans of the Steampunk genre that like tile laying games with aspects of worker placement might enjoy this one. I would recommend giving this one a try first. That way you can see if it’s right for you. For me however, the hunt continues for the perfect Steampunk game. For more information about this and other great games, please check out Tasty Minstrel Games at their site. I'm a happily married man with 2 wonderful kids. I love my family very much. I'm a big fan of board, card and RPG games and have been playing for over 20 years. As a board and card game reviewer, I'm hoping that this blog will inform, educate and entertain you. If you like it, please tell your friends and have them join in on the conversations. Thanks and GAME ON!! This entry was posted in Reviews and tagged alex, alex churchill, board, board games, card, card games, churchill, games, minstrel, steam, steam works, tasty, tasty minstrel games, works. Bookmark the permalink.